This weekend I adulted and scheduled myself a facial for the very first time in my life. I'm laying in bed at 2am writing this because it's so fresh in mind that I don't want to lose it. The process was insanely easy to book online through their portal. A mere email and password and I was logged in. They has a standard profile with your information and skin type. I had a lot of fun going through each service that they provided. Anything from a standard Express Facial to a Micro current Platinum Facial (I still don't know what that is). Since this was my first appointment and I have oily and ache prone skin/sensitive skin, I decided to go for a Custom Naturopathic Facial. The facial I chose included a complete consultation and custom-blended concoction to meet my skin's issues. Per the website it "...includes cleansing, exfoliation, light extractions, a detoxifying and anti-aging treatment mask, and facial massage to reinvigorate your facial muscles and pores." Sounds a little terrifying, right? Particularly the "light extractions" part. Walking into the spa was every woman's dream. Products spaced and inch apart on the walls, shelves and a vanities filled with goodies. A laptop for where the receptionist sits to check you in and out with a lux chair and a white desk. They had changed the office around since I'd been there in 2012. It looked great. 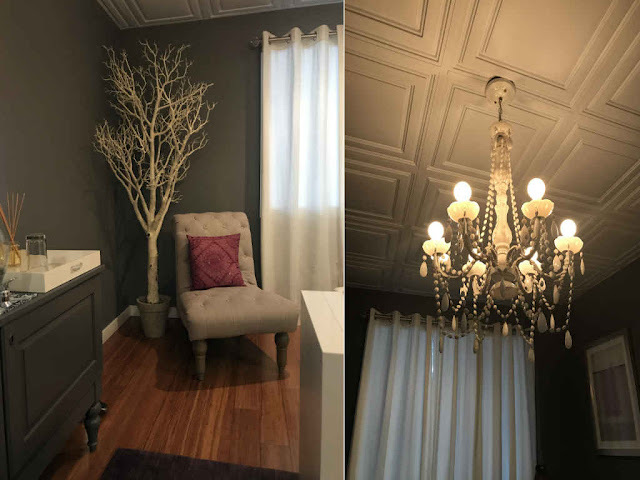 The waiting room was "modern lux" with chic chairs, chandelier and magazines in piles while you wait. Organic tea and water were offered upon sitting and my wait was nothing more than 5 minutes. I was greeted with a warm welcome and a walk through of the overall treatment. 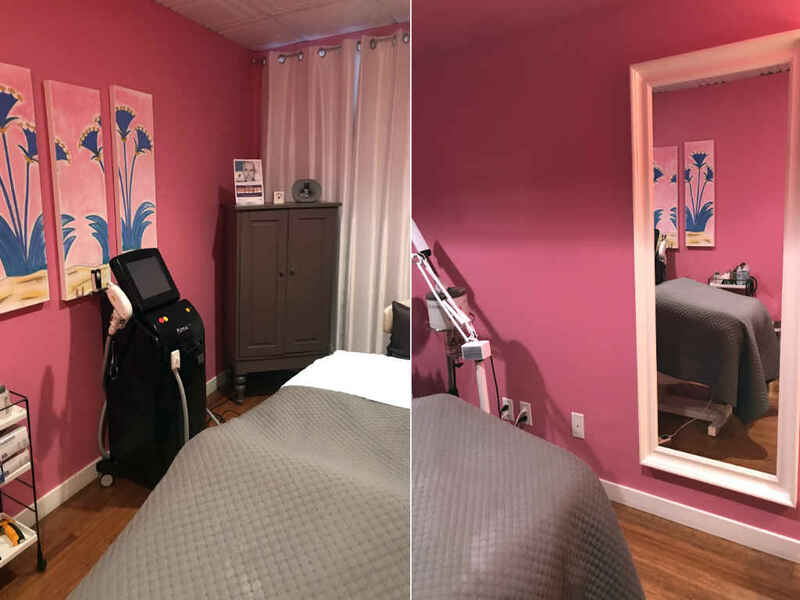 The facial room was set to the perfect temperature and at this point I'm thinking "man oh man, these ladies really know what they're doing to accommodate you". 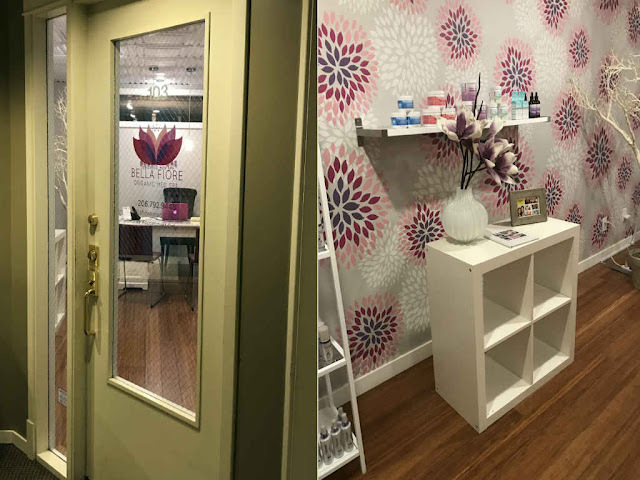 My esthetician was Sue Yeck, a woman who has been in the beauty business for well over 30 years and used to sell high end product at departments stores. Until, that is, she learned about many harmful fillers that are added in generic and high end products. This was one of our conversations, as I laid on a heated bed with my knees nicely elevated for comfort. She had asked me to remove my tank and bra, since she was also going to massage my décolleté and down my arms. Not too soon after I had settled in, she knocked at the door before walking in with a steamy bowl of water, towel and natural face coolant. As she sat down, she said "Now, tell me about your skin and your skincare routine". I felt so at ease. No judgement, no concern that she was going to try and sell me an entire new line. Nothing. I told her about my All-Natural Neutrogena cleanser that I use morning and night and the exfoliant/scrub I bought about two months ago. I told her I moisturize everyday. Then I told her my sob ache story growing up, how no one really taught me about skin care or telling me the importance of washing your face in the morning, never the less at night. I also told her how I was concerned about my deep huge crater sized pores, my nose (ugh), chin and worrying about wrinkles in the future. Then, I told her my biggest concern: I have had a bump on my left cheek for years now. What I thought could be an old blemish that had healed itself over and over again, layer upon layer, through the years. She looked at it and said "well, let me examine that when I get to extractions and we'll see if it's something I can take care of today". My doubt was high. There's no way this lady was going to be able to get rid of this gigantuine mountain on my face without some kind of laser or microdermabrasion machine. I was convinced. Sue walked me through each step as I awaited the extraction part. We went through a full cleansing, twice, with papaya, chili spices and coconut in it. Which smelled insane, btw. I'm obsessed. Then a steam facial which was follow up with a warm towel around my face to keep my skin soft and open. It would be a disservice to not mention how incredible it felt. There were a lot of layers to this facial which I enjoyed. I genuinely felt like I was getting the royal treatment because I don't take care of my skin very well. I thought I did but, alas, after this I know the truth! I went through a exfoliant, twice. She really worked out the dead skin cells and to also dig into my pores. Now, get excited, here it comes: The extractions. Well, that Sue did the most. She checked out that mountain on my face, under a magnified glass mind you, and was suddenly so chipper. "AH, I see the spot. If you don't mind, I'd like to use a needle to extract it" she says. She shows me the tiny needle that some what looks like a itty bitty shot and a thumb tack. I say "Yes, for the love. Do whatever you need". She explained the process and described it as "pulling a cork from a bottle of wine". That is not how I would describe it after I saw the results. The prick was relatively painless. I did not yip nor yelp. *If you are squeamish skip ahead to below the photo* I sat calming as she extracted and then showed me what had been laying in my skin under layers and layers of pore. She moved her tissue toward where I can see and there I saw the green and yellow bacteria that had been living under the bed of my face. I was mortified! Genuinely disgusted and she just laughed it off and said "well, how could you possibly have gotten that out?". Oh, guys. The level of red I must have turned. I tried for years to rid of that thing! So, now, I'm on the healing path. It's still a bit risen but it's slowly going down day by day. After my embarrassing little moment, she asked it she could use a few needles in other areas and I begged her to get what she could. She spent a great deal of time extracting my nose and was very tentative. Afterward she follow up with a mask which she painted on with a brush. As I laid on the bed, she gave an aromatherapy message to my upper back, chest, neck and arms. That was my favorite part. In the end, I purchased a serum. It's all natural and organic, just like their spa. Sue was more than understanding of pricing and was so understanding of general care. Even though she'd love to see me every single month, she said she would at least love to see me next month. Mostly to follow up and to check on my (now unplugged) pore. Then she thought that it was be reasonable to come in for a facial once a quarter. I thought that was plenty reasonable. Truthfully, I had a very education experience. Significantly more educational than I thought a facial would be. On my next visit, which I will plan for next month since she recommended it so strongly, I do plan to also purchase the cleanser she recommended. 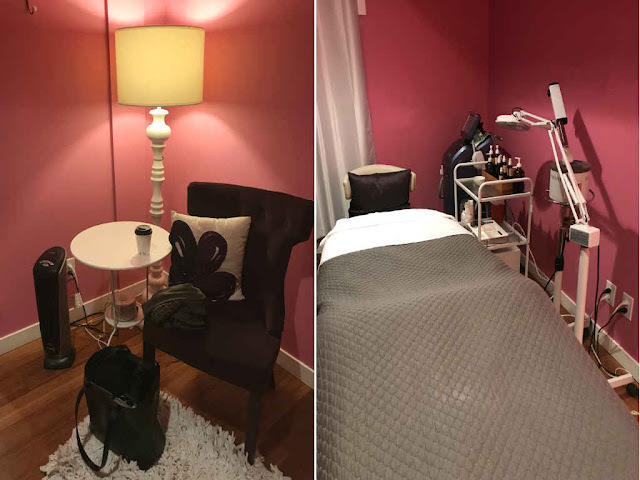 Though the facial is obviously an expense, I have crossed compared with many other spas and checked with friends to see where they go and their normal monthly cost. Bella Fiore is on point with their competitive pricing. Due to this, I highly recommend this spa and their all natural and organic services. Especially if you are a firm believer in what goes on your skin will absorb into your body. I will do a follow up next month! I do hope to try another one of their services in the future. I think it would be a lot of fun to try their Reflexology services and to try out their Monthly Signature Club for facials.